Why it matters: These re-uploads have become more common as some people look to take advantage of popular trending videos for their own monetary gain. Copyright Match hopes to give creators another tool to prevent this. YouTube has had difficulty regarding copyright issues on their site and to help combat that, today they are announcing a new system to help creators protect their content. 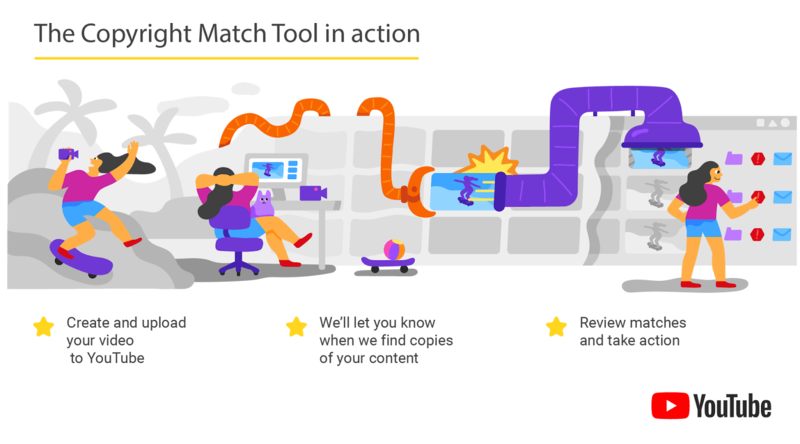 The upcoming Copyright Match tool will automatically scan videos on YouTube and alert the original creator if it finds that one of their videos has been re-uploaded without their permission. Copyright Match sounds very similar to YouTube's older Content ID system and while the two use similar technologies, Copyright Match is designed specifically for full re-uploads. Once a creator uploads a video, Copyright Match will set that original as its standard. From then on, any re-uploads of that same video at a later date will be flagged as invalid and sent to the original content creator for review. They have three options of how to move forward: do nothing, contact the channel that re-uploaded the video, or ask YouTube to remove the video. It's likely that most creators will choose the third option to help protect their content. In their announcement of the new tool, YouTube is placing responsibility on the creators themselves to make requests only when the offending video infringes on a copyright the creator owns. In an effort to help protect against misuse of the tool, requests will also be reviewed to ensure they comply with YouTube's copyright policies. YouTube has already been testing the feature with a select group of creators and plans to roll it out to all creators with more than 100k subscribers next week. If it remains successful, all creators will gain access to the tool in the coming months through the YouTube Partner Program. Over the past few years, YouTube has received backlash from the community for not doing enough to prevent the misuse of copyright takedowns so this new feature will certainly be watched closely.